The Cucumber (Cucumis sativus) is a widely cultivated plant in the gourd family Cucurbitaceae. It is a creeping vine which bears cylindrical edible fruit when ripe. 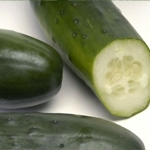 There are three main varieties of cucumber: "slicing", "pickling", and "burpless". Within these varieties, several different cultivars have emerged.